I am back with Remaining part of Excel's File Menu and Commands. As you remember, in previous post, we have talked about File Menu Commands upto Web Page Preview. Lets start with remaining commands. When you click this option Page Setup dialogue box appears from which you can adjust document margins, paper size, orientation, header footer, sheet, etc. This is one of the important option for printing document. This command sets the print area of current worksheet. You can choose which cell range should be printed in paper. You can also clear print area that you previously set. 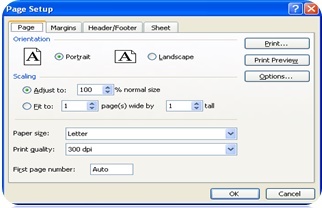 To Set a Print Area, choose range of cells by selecting, then click on File menu, choose Print Area option and finally choose Set Print Area option. To Remove a Print Area click on File menu, go to Print Area and choose Clear Print Area option. This option shows how the document will appear after printing in paper. This is very important task before printing any document to save Paper and money. If any improvement needed you have to adjust document margins and other properties from Page Setup option. This command sends instruction to attached printer that is configured with system. 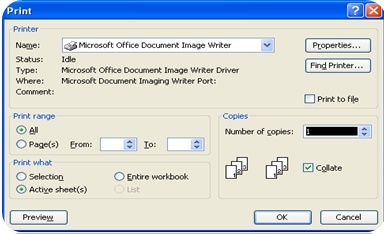 You have options to choose Printer, Page Range, Number of Copies, etc. Shortcut key for this command is CTRL+P. This command shows you Document Properties dialogue box to edit or change properties of document such as Title, Subject, Author, Company, Keywords, and other values which are very important to determine the documents property value which will creates Identity of file. This command terminates MS-Excel. This is alternative of ALT+F4 key. You can also quit application from Title Bar or Task bar also. If the document is not saved yet, MS-Word prompts you to save document and shows Save As dialogue box if chosen Yes from prompt and terminates after saving, if chosen No, terminates immediately and if chosen Cancel MS-Excel remains opened. Keep reading, for more Tutorials and Articles subscribe.